Numerical analysis has been carried out on the problem of magnetohydrodynamic boundary layer flow of a nanofluid over a moving surface in the presence of thermal radiation. The governing partial differential equations were transformed into a system of ordinary differential equations using suitable similarity transformations. The resultant ordinary equations were then solved using the spectral relaxation method. Effects of the physical parameters on the velocity, temperature and concentration profiles as well as the local skin-friction coefficient and the heat and mass transfer rates are depicted graphically and/or in tabular form. Many engineering and industrial processes involve heat transfer by means of a flowing fluid in either laminar or turbulent regimes. A decrease in thermal resistance of heat transfer in the fluids would significantly benefit many of these applications/processes. Nanofluids have the potential to reduce thermal resistances, and industrial groups such as electronics, medical, food and manufacturing would benefit from such improved heat transfer. It is well known that conventional heat transfer fluids, such as oil, water and ethylene glycol mixture, are poor heat transfer fluids. Choi  introduced the technique of nanofluids by using a mixture of nanoparticles and the base fluids. The presence of the nanoparticles in the nanofluid increases the thermal conductivity and therefore substantially enhances the heat transfer characteristics of the nanofluid. Nanotechnology has been an ongoing hot topic of discussion in public health as researchers claim that nanoparticles could present possible dangers in health and environment, Mnyusiwella et al. . There are several numerical studies on the modelling of natural convection heat transfer in nanofluids (Kaka and Pramuanjaroekij , Godson et al. , Olanrewaju et al. ). Gbadeyan et al. numerically studied boundary layer flow induced in a nanofluid due to a linearly stretching sheet in the presence of thermal radiation and induced magnetic field. Khan and Aziz  studied natural convection flow of a nanofluid over a vertical plate with a uniform surface heat flux. Makinde and Aziz  investigated boundary layer flow of a nanofluid past a stretching sheet with a convective boundary conditions. Khan et al. studied the unsteady free convection boundary layer flow of a nanofluid along a stretching sheet with thermal radiation in the presence of a magnetic field. Thermal radiation-convection interaction problems are found in the cooling of high temperature components design where heat transfer from surfaces occurs by parallel radiation and convection, the interaction of incident solar radiation with the earth’s surface to produce complex free convection patterns. Hadey et al. studied the flow and heat transfer characteristics of a viscous nanofluid over a nonlinearly stretching sheet in the presence of thermal radiation. Khan et al. analyzed the effects of variable viscosity and thermal conductivity on the flow and heat transfer in a laminar liquid film on a horizontal shrinking/stretching sheet. Khan et al. investigated, by employing the homotopy perturbation transform method (HPTM) and the Padé approximation, the problem of magnetohydrodynamic (MHD) boundary layer flow over a nonlinear porous stretching sheet. Khan et al. considered a two-dimensional, steady magnetohydrodynamic flow and heat transfer analysis of a non-Newtonian fluid in a channel with a constant wall temperature in the presence of thermal radiation. As the governing equations modelling MHD flow and heat transfer of nanofluids are highly nonlinear, exact solutions are impossible to obtain. Over the years, numerical methods have been developed, improved, and hybred as a way of getting more accurate solutions. The current study seeks to employ a recently developed numerical technique known as spectral relaxation method  to solve the problem of magnetohydrodynamic boundary layer flow of nanofluids over a moving surface in the presence of thermal radiation. The current method has been successfully employed in [15–20], among others. We apply this method to the problem of MHD flow of a nanofluid past a stretching sheet in the presence of thermal radiation. The governing boundary layer equations are transformed to a system of nonlinear ordinary differential by using suitable local similarity variables. where u and v are the velocity components along the x-axis and y-axis, respectively, α = k / ( ρ c ) f is the thermal diffusivity of the fluid, ν is the kinematic viscosity coefficient, k is the thermal conductivity, q r is the heat flux, D B is the Brownian diffusion coefficient, D T is the thermophoresis diffusion coefficient, B 0 is the uniform magnetic field strength of the base fluid, σ is the electrical conductivity of the base fluid, τ is the ratio of the nanoparticle heat capacity and the base fluid heat capacity. u → U , T → T ∞ , C → C ∞ as y → ∞ . The surface moving parameter λ > 0 corresponds to the downstream movement of the plate from the origin, while λ < 0 corresponds to the upstream movement of the plate. where σ ∗ and K s are the Stefan-Boltzman constant and the Rosseland mean absorption coefficient, respectively. We assume that the temperature differences within the flow are sufficiently small such that T 4 may be expressed as a linear function of temperature. T 4 ≈ 4 T ∞ 3 T − 3 T ∞ 4 . ∂ q r ∂ y = − 16 σ ∗ T ∞ 3 3 K s ∂ 2 T ∂ y 2 .
where R = 4 α δ T ∞ 3 k k is the radiation parameter, Pr = ν α is the Prandtl number, Le = ν D B is the Lewis number, Ha = 2 x B 0 2 U ρ f is the local Hartman number, Nb = ( ρ c ) p D B ( ϕ w − ϕ ∞ ) ( ρ C ) f ν is the Brownian motion parameter and Nt = ( ρ C ) p ρ T ( T w − T ∞ ) ( ρ c ) f T ∞ ν is the thermophoresis parameter. where Re x = U x / ν is the local Reynolds number. To solve the set of ordinary differential equations (11)-(13) together with the boundary conditions (14) and (15), we employ the Chebyshev pseudo-spectral method known as spectral relaxation method (SRM). This method transforms sets of nonlinear ordinary differential into sets of linear ordinary differential equations. The entire computational procedure is implemented using a program written in MATLAB computer language. The fluid velocity, temperature, the local skin-friction coefficient and the local Nusselt and Sherwood numbers are determined from these numerical computations. The SRM algorithm starts with the assumption of having a system of m nonlinear ordinary differential equations in m unknowns functions, z i ( η ) , i = 1 , 2 , … , m , where η ∈ [ a , b ] is the independent variable. To solve the resultant iterative scheme, we then use the Chebyshev pseudo-spectral method. The details of the spectral methods can be found in Canuto et al. , Trefethen . 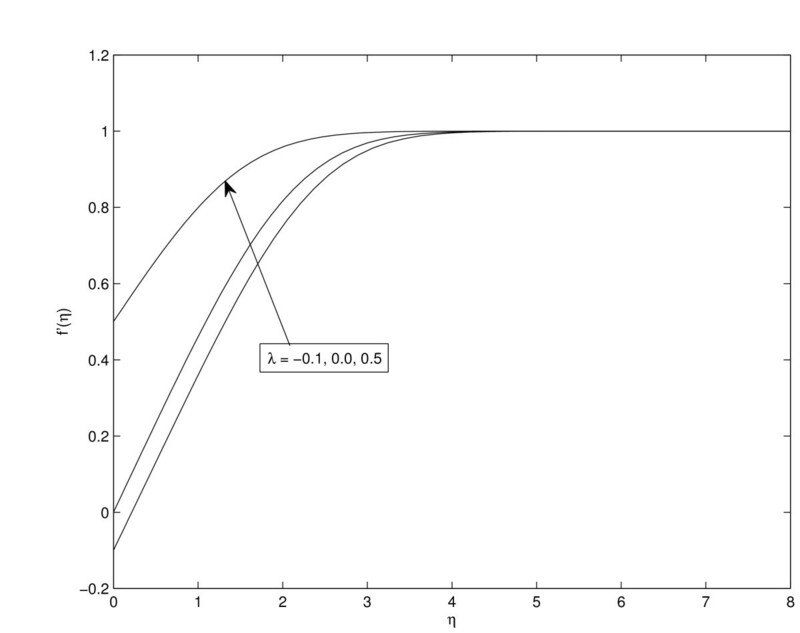 Before applying the spectral method, the domain on which the governing equation is defined is transformed to the interval [ − 1 , 1 ] on which the spectral method can then be implemented. We use the transformation η = ( b − a ) ( τ + 1 ) / 2 to map the interval [ a , b ] to [ − 1 , 1 ] . f ( 0 ) = 0 , g ( 0 ) = λ , θ ( 0 ) = ϕ ( 0 ) = 1 , g ( ∞ ) = 1 , θ ( ∞ ) = 0 , ϕ ( ∞ ) = 0 .
ϕ r + 1 ″ + Le f r + 1 ϕ r + 1 ′ = − Nt Nb θ r + 1 ″ , ϕ r + 1 ( 0 ) = 1 , ϕ r + 1 ( ∞ ) = 0 . The above equations form a system of linear decoupled equations which can be solved iteratively for r = 1 , 2 , … , starting from initial guesses/approximations ( g 0 ( η ) , θ ( η ) , ϕ ( η ) ) . Er = Max ( ∥ f r + 1 − f r ∥ ; ∥ g r + 1 − g r ∥ ; ∥ θ r + 1 − θ r ∥ ; ∥ ϕ r + 1 − ϕ r ∥ ) . Accuracy of the scheme is established by increasing the number of collocation points N until the solutions are consistent and further increases do not change the value of the solutions. The system of ordinary differential equations (12)-(13) subject to the boundary conditions (14)-(15) are numerically solved by using spectral relaxation method (SRM). This is a recently developed method, and details of the method are found in . The SRM results presented in this work were obtained using N = 50 collocation points, and also the convergence was achieved after as few as five iterations. We also take 15 to be the infinity value η ∞ . We use these default values for the parameters Pr = 0.71 , Nt = Nb = 0.3 , Le = 2 , R = 2 , λ = 0.1 . Tables 1 through 5 show a comparison among the SRM results to those previously obtained results as well as the b v p 4 c results. As can be clearly observed from these tables, there are excellent agreements in all the tables giving us confidence in the findings of this study. Table 1 depicts the effects of increasing the values of the Prandtl number on heat and mass transfers. Physically, the Prandtl number is a dimensionless number which is the ratio of momentum diffusivity (kinematic viscosity) to thermal diffusivity. Increasing values of the Prandtl number means that momentum diffusivity dominates thermal diffusivity. Thus, the rate of heat transfer at the surface increases with increasing values of the Prandtl number while the rate of mass transfer is reduced as the Prandtl number increases. Table 2 shows the effect of increasing the Lewis number Le on the heat and mass transfer coefficients. The Lewis number is defined as the ratio of thermal diffusivity to mass diffusivity or the ratio of the Schmidt number to the Prandtl number. 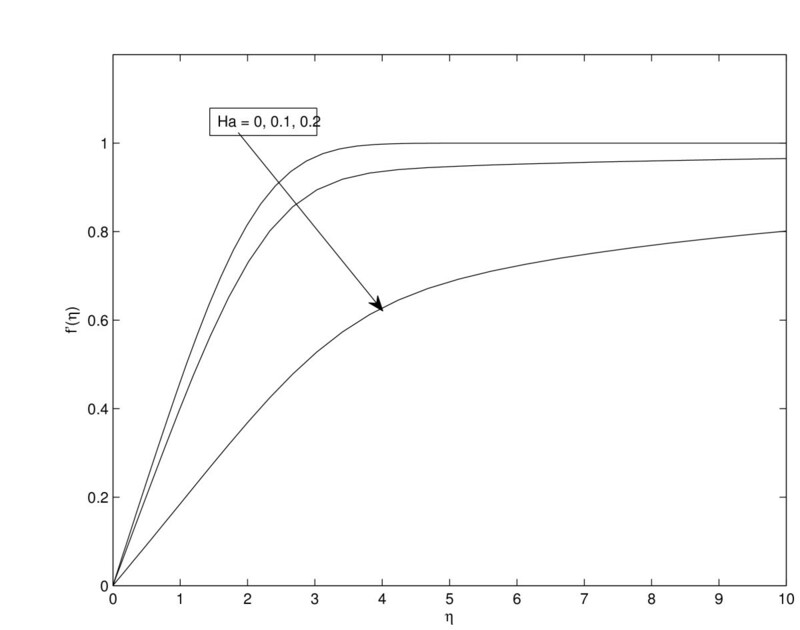 As can be clearly seen in Table 2, increasing the Lewis number means that the fluid becomes more viscous therefore causing increases in the rate of mass transfer at the surface. As expected, increasing the Lewis number reduces the rate of heat transfer on the surface as this corresponds to the reduced Prandtl number. In Table 3, we display the effect of increasing the values of the moving surface parameter λ on the rates of heat and mass transfer. These rates both increase with increasing values of the surface moving parameter. Table 4 depicts the effects of Brownian motion parameter Nb and the thermophoresis parameter on the heat and mass transfer coefficients. 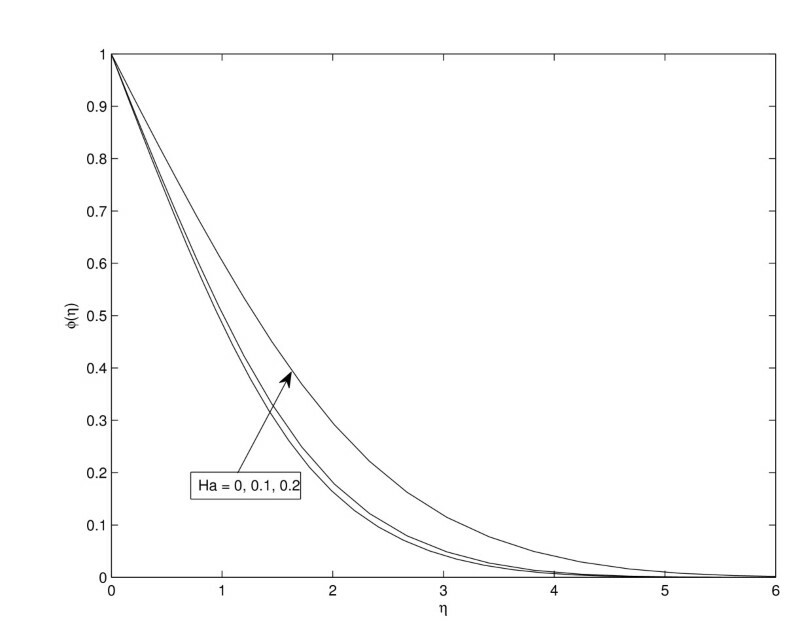 The rate of heat transfer on the surface as expected is reduced as the Brownian motion parameter increases, while the rate of mass transfer slightly increases as this parameter increases. 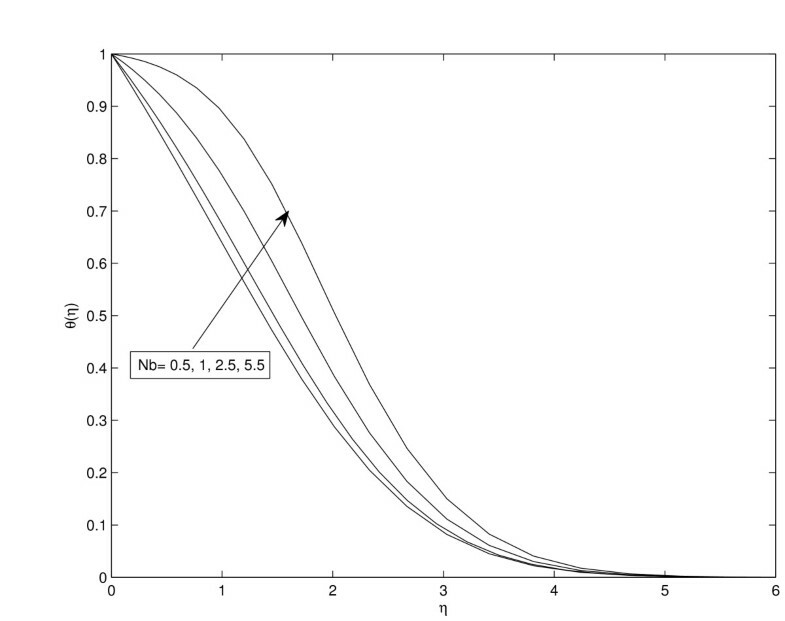 Also in Table 4, we depict the effect of the thermophoresis parameter Nt on the Nusselt and Sherwood numbers. By definition thermophoresis is the migration of a colloidal particle in a solution in response to a macroscopic temperature gradient. Both the Nusselt number and the Sherwood number are reduced as the values of this parameter increases. In Table 5 we show the influence of the velocity parameter on the skin friction. 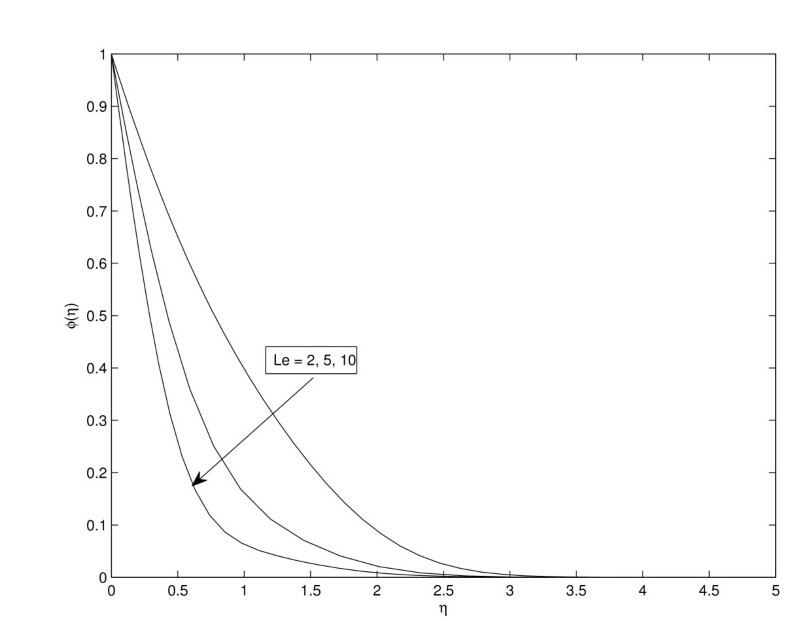 Increasing positive values of λ corresponds to accelerated movement of the plate. This in turn results in reduction of skin friction. The effects of physical parameters of importance in this study on the velocity, temperature and nanoparticles distributions are depicted in Figures 1-9. Figure 1 displays the effect of the Hartman number Ha on the dimensionless velocity. The presence of a magnetic field normal to the flow in an electrically conducting fluid gives rise to a Lorentz force, which acts against the flow. 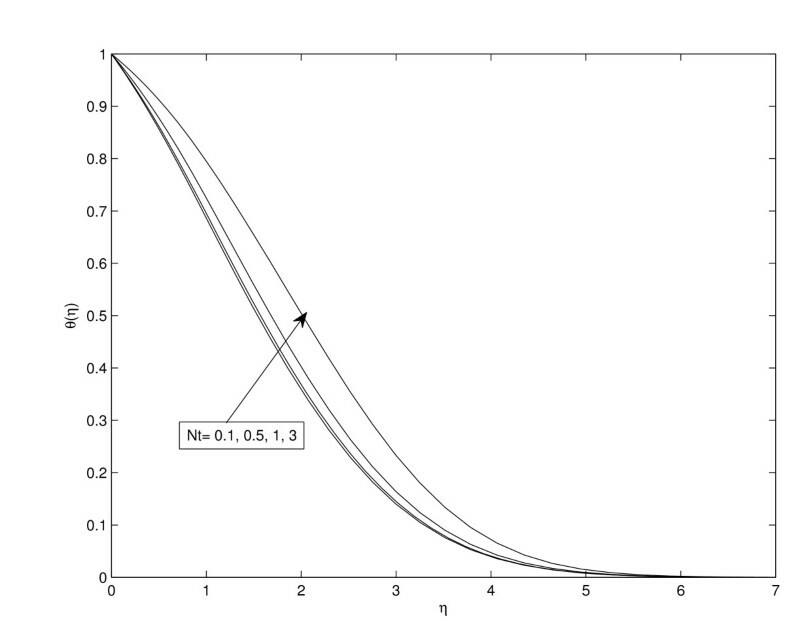 Thus the velocity distributions of the nanofluid are greatly reduced with increasing values of the Hartman number. Graph of the SRM solutions of the velocity profiles for different values of Ha . Figure 2 presents the effect of λ on the velocity profiles. Increasing the down stream movement of the plate from the origin, as expected, enhances the fluid velocity. 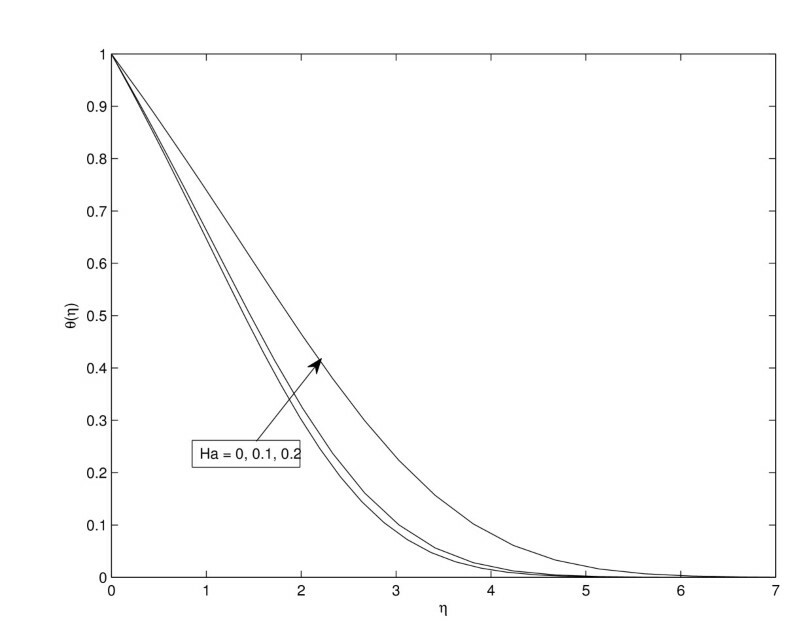 The influence of the magnetic field parameter on the temperature distribution is shown in Figure 3. From this figure, we observe that the temperature profiles increase with increasing values of the magnetic field parameter. This implies that the applied magnetic field tends to heat the fluid, thus reducing the heat transfer from the wall. Graph of the SRM solutions of the velocity profiles for different values of λ . Temperature profiles for different values of Ha . 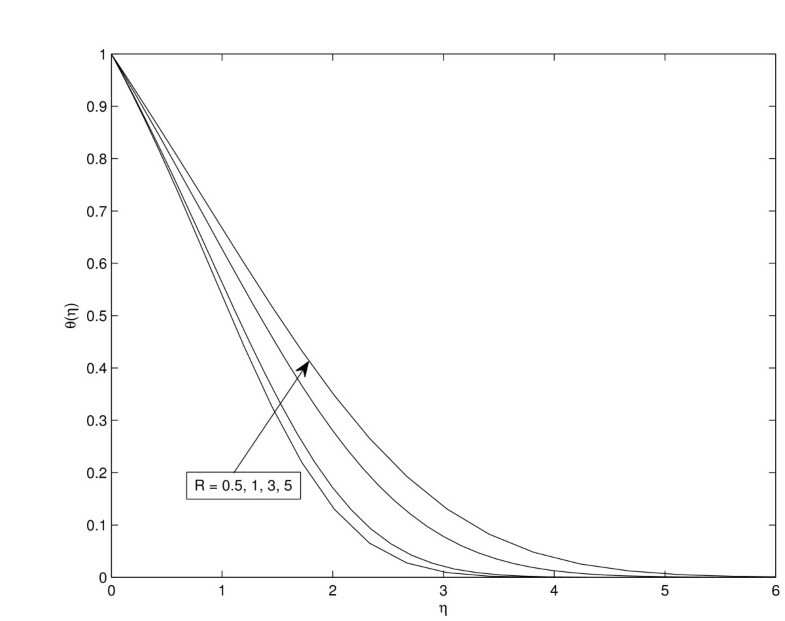 Figure 4 shows the effect of increasing the radiation parameter R on the temperature distribution. 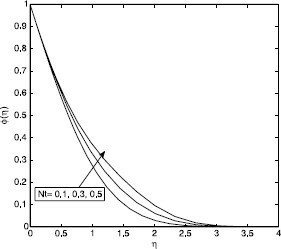 We observe in this figure that the thickness of the thermal boundary layer increases as the values of the radiation parameter are increased. Thus thermal radiation enhances thermal diffusion. Graph of the SRM solutions of the temperature profiles for different values of R .
In Figure 5, we have the influence of the thermophoresis parameter on the temperature distribution. Increases in this parameter physically imply high temperature gradients. This in turn results in high temperature distributions within the nanofluid flow. Increasing the values of the Brownian motion parameter Nb results in thickening of the thermal boundary layer. Thus enhancing the temperature of the nanofluid as can be easily seen in Figure 6. Influence of Nt on the temperature profiles. Graph of the SRM solutions of the temperature profiles for different values of Nb . The effect of the magnetic field strength Ha on the nanoparticle volume fraction profiles is shown in Figure 7. Application of a normal magnetic field results in slowing down of the nanofluid flow thereby resulting in volumetric increase of the nanoparticles within the flow as less particles are now transported per given time. Graph of the SRM solutions of the nanoparticle volume fraction profiles for different values of Ha . In Figure 8 we depict the effect of the Lewis number on the nanoparticles. Large values of the Lewis number implies increased values of the Schmidt number which in turn results in thinning of the solutal boundary layer as can be clearly seen in Figure 8. Increasing the thermophoresis as expected results in increase of the nanoparticle volume fraction profiles. This is displayed in Figure 9. Influence of Le on the nanoparticle volume fraction profiles. Influence of Nt on the nanoparticle volume fraction profiles. Numerical analysis has been carried out on MHD boundary layer flow of nanofluids over a moving surface in the presence of thermal radiation. The governing partial differential equations were transformed into a system of ordinary differential equations using suitable similarity transformations. The resultant equations were then solved using the spectral relaxation method. The accuracy of the SRM is validated against the MATLAB in-built b v p 4 c routine for solving boundary value problems as well as previously obtained results. An excellent agreement was observed between our results and those obtained using other methods giving confidence to our present results. We observed that the local temperature rises as the Brownian motion, thermophoresis and radiation effects intensify. Lastly, the Nusselt number decreases while the Sherwood number increases as the Brownian motion and thermophoresis effects are increased. The authors wish to acknowledge financial support from the University of Venda, NRF and University of Botswana. SS formulated, generated and discussed the results, and JP discussed the results and proofread the manuscript. All authors read and approved the final manuscript.